The controversy around the persistent booing of Adam Goodes has dominated the AFL championship this year. Naturally, this is reflected on social media where we can see Facebook pages both supporting Adam Goodes and vilifying him. In this briefing, we examine some of the arguments used by supporters of anti-Adam Goodes pages to justify their aggressive, persistent and ritualised booing of the Aboriginal Sydney Swan player. We also discuss the larger social context within which the booing occurs and why, in light of this, many consider the booing to be racist. 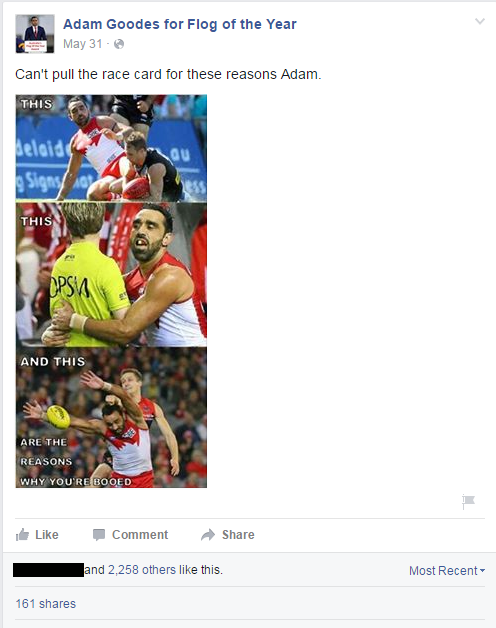 Many pages about Adam Goodes have also become hotbeds for blatantly racist comments and memes. This briefing provides examples from Facebook of such content along with a request for your help reporting them. First, we share social media comments that justify the booing. We unpeel these arguments to examine underlying rationalisations which may be regarded as racist. We then share some tweets and Facebook comments that are clearly racist, and ask our supporters to report them. We discuss how to report the comments, posts and tweets to Facebook, Twitter and our FightAgainstHate.com monitoring tool. We wish to make clear from the start that not all booing of Adam Goodes is inspired by racism. At the same time, such booing appears to give public license to those who are attacking Goodes with a racist motivation. We would ask those who would consider booing Goodes out of a non-racist motivation to consider the wider context and the effect their action is likely to have, even if that is not their intent. The ritualised booing of Adam Goodes: Racist or Not? 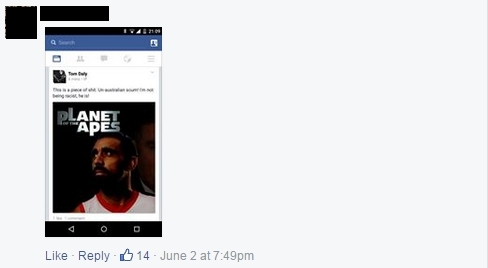 Page admins and commentators on the anti-Adam Goodes pages claim that the booing has nothing to do with racism. Here are some of the reasons they present for booing him. 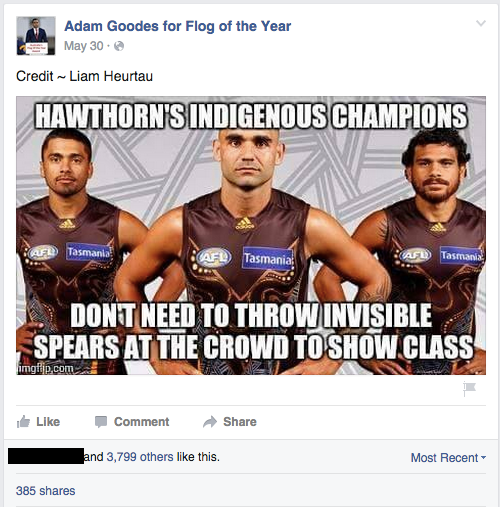 The comments we share are from the Facebook page Adam Goodes for the Flog of the Year (ID# 1589916354604087), which has the largest supporter base among the anti-Adam Goodes Facebook pages. 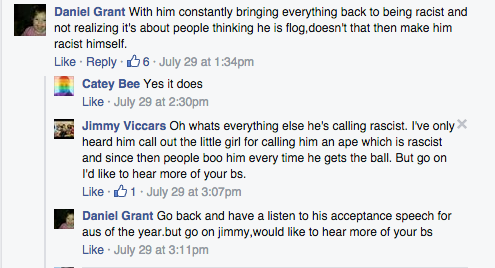 Here are some comments that say that booing has nothing to do with racism. They just don’t like Adam Goodes. They don’t like his aggressive playing style, his staging for free kicks and for generally being a “wanker”. The problem with this argument is that too many AFL players stage for free kicks, and play an aggressive game. Adam Goodes is unexceptional in this behaviour. Yet, in the minds of the fans, his aggression sticks out. In fact, it sticks out so much that they have made a ritual out of booing him aggressively and pointedly throughout the current AFL season. When a commentator writes, they think he is a “wanker”, “dickhead”, “flog”, we reach closer to describing a personal dislike to Goodes. Such dislike cannot be justified by his aggression or playing style, it isn’t unique in AFL. Goodes in exceptional in the AFL in his willingness to point out and call out racism, both in sports and in broader Australian society, and in publicly expressing his Aboriginal culture. The personal dislike for which Goodes, and Goodes alone, is can only arise out this exception, this is discussed in the next section. 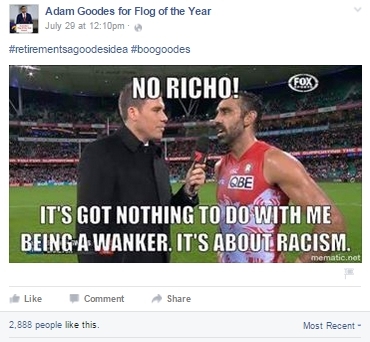 Many posts and comments on anti-Adam Goodes pages suggest that Goodes is racist for constantly keeping up a dialogue about “racism”. 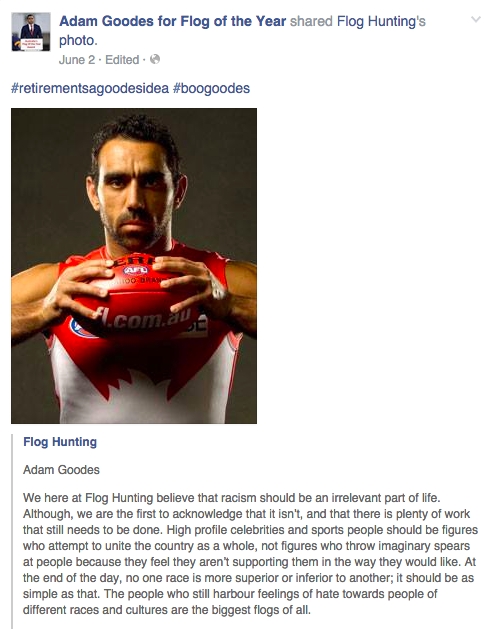 In doing so, it is Goodes who is bringing racism into the sport not the fans. This is rationalised in many ways. First, if fans were racist, they would be booing all the Indigenous AFL players, and wouldn’t be singling Adam Goodes’ out. Second, he did a traditional Aboriginal dance involving the throwing of spears against opposition fans at a match. In doing so, he brought his aboriginality into the sport. Third, his acceptance speech of the Australian of the Year award in 2014 referred to racism. And for these transgressions, he needs to be booed longer and harder. Below are examples of comments making the above arguments. Just because the other 70 players do not speak up against racism, doesn’t mean that it doesn’t exist or they don’t feel it. All it means is that they don’t speak out against it. 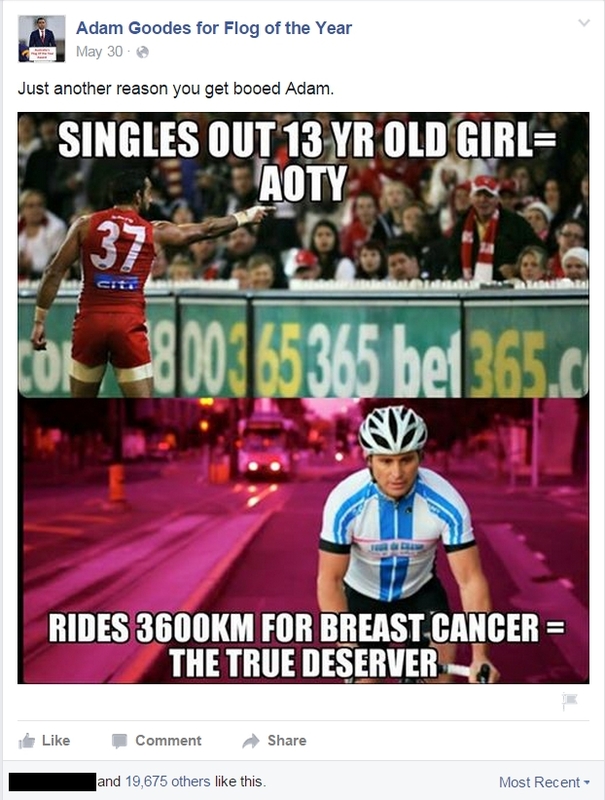 Adam Goodes does, both on and off field. He is a tireless champion of the rights of the Indigenous community, and calls out racism wherever he sees it, whether that comes from a 13-year-old football fan or a football club president. He was the ambassador of the #RacismItStopsWithMe campaign managed by the Australian Human Rights Commission. He is deeply proud of his own aboriginal heritage and is involved in a number of Indigenous sporting and community programmes. His work with the Indigenous community and his efforts to stamp out racism, on and off the field, were the primary reasons why he was selected for the Australian of the Year award in 2014. The award was not given only to honour his sporting achievements. So it is natural that he talked about racism in Australian society in his acceptance speech (though he doesn’t mention “invasion day” in it). However, as this article points out, his speech was “unfailingly polite, inclusive and inspirational. It was gracious and full of hope.” The article includes a transcript of the speech. “It’s about the fact that Australia is generally a very tolerant society, until its minorities demonstrate that they don’t know their place. And at that moment… the minute someone in a minority position acts as though they are not a mere supplicant, then we lose our minds.” He adds, “And that’s why Adam Goodes ruffles feathers. It’s not because he’s controversial, it’s not because he’s a provocateur. It’s none of that. It’s because he actually says I’m going to say something, and I’m going to express Aboriginality, and I’m going to do it at a time and a place, in which there is no cover, no veneer.” This comment from the page clearly underlines Aly’s point. Seen from this context, all the social media comments we shared above against Adam Goodes reflect a discomfort with open discussions on racism, and spontaneous and unofficial celebrations of Aboriginal culture in our public life. No comment against Goodes included a specific instance where Goodes called out racism where it didn’t exist. His advocacy for the Indigenous community and culture is hardly controversial, given the deep marginalisation of the community in Australia. His public expression of his Aboriginal culture – for example, doing an Aboriginal celebratory dance on field in his moment of triumph – is viewed as threatening and challenging only because we are not used to seeing it in public life. This discomfort with public acknowledgment of people from minority cultures in the sport and in larger society is brought home by the following conversation on Facebook. Next, we look at the famous incident in which Adam Goodes publicly called out a racist experience, for which he is now being pilloried. Many commentators complain about Goodes’ handling of a 13-year-old Collingwood supporter at a match on May 24, 2013. The girl from Regional Victoria was persistently calling him an “ape”, and Goodes pointed the girl out to security and had her ejected from the stadium. Eventually, her name was revealed in the media and she was also questioned by the Victoria Police. To many, his singling out of the young fan and getting her ejected was a step too far. 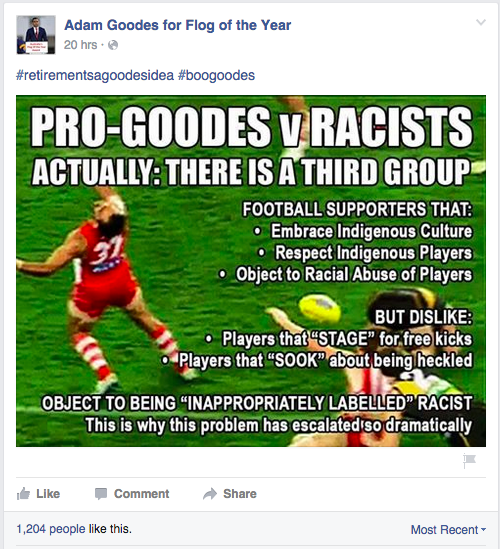 However, such arguments act as diversions from the racism which prompted Goodes’ reaction. The incident took place in the opening match of the AFL’s Indigenous Round. 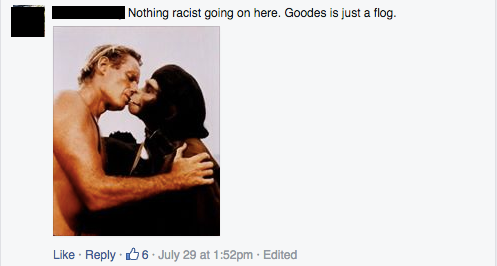 The girl was present with her grandmother when she called Goodes “an ape”. This is a serious racial slur against Indigenous Australians. In calling it out, he took a public stand for his own dignity and that of his community. He also acted as a true ambassador of the “Racism It Stops With Me” campaign. The whole point of the campaign is to encourage each individual to speak out against racism, whether directed at themselves or people around them. This stand needs to be taken publicly, even though it is confronting, not to teach the abuser a lesson but to send a message that such behaviour is not acceptable in our society. So for Goodes to have dealt with it privately (as some commentators suggested) would not have served this purpose. In all his subsequent media interviews and talks, Goodes made a clear and concerted effort to draw attention away from the girl and to the lack of education in our society that led her to use the racist slur. He said he is not blaming the girl but that “she deserved to be supported and educated about why the racist comment was unacceptable”. In fact, within an hour and half of the incident, he announced on Twitter. If we as a society, didn’t pay heed to Goodes’ advice to focus on the issue and not on blaming and vilifying a 13-year-old girl, it is not his fault. Goodes cannot be blamed for how the media, and society at large, failed to respect the girl’s right to not be identified, and named and shamed her instead. He certainly did not ask for that. On contrary, he asked us to support her. Some commentators are now calling for Goodes to apologise to the teenager. In doing so, they exonerate the girl’s actions completely and focussing the entire debate onto her subsequent public vilification, which Goodes actively discouraged. In doing so, they clearly give out the message, that the emotional well being of a white teenage girl indulging in racist behaviour is entirely the responsibility of the victimised Aboriginal man, not ours as a society who failed to educate or support her. 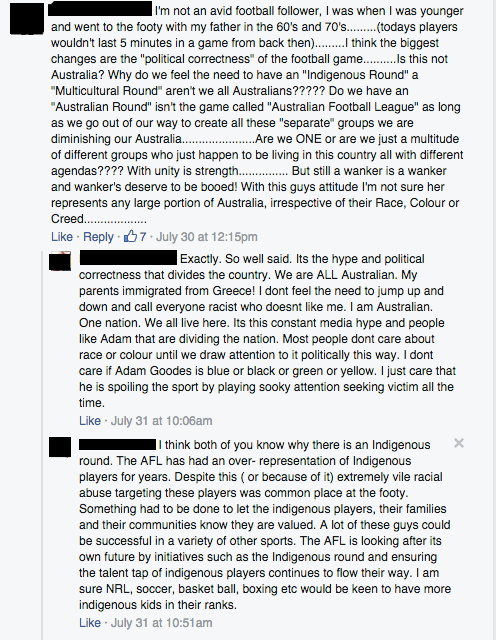 The above discussion underscores the general racist context of anti-Adam Goodes Pages. We now share some Facebook posts, comments, images and Tweets that are clearly racist, and have no place in our social media platforms. 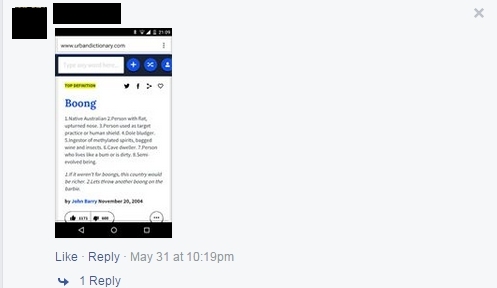 You can view the post and report it here. 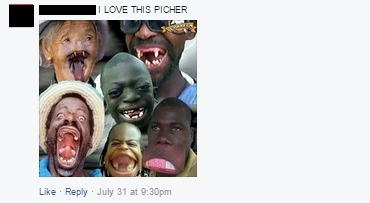 You can view and report the image here. 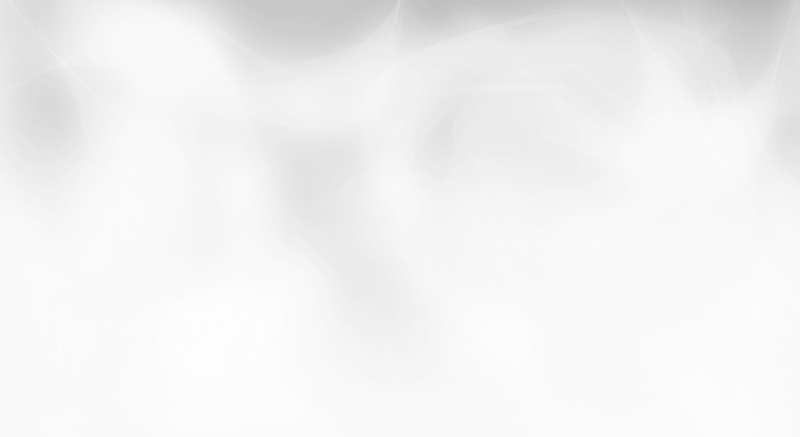 You can view and report this image here. Page supporting the booing of Adam Goodes, a sportsman and a recipient of the Australian for the Year award, need to be reported because they are essentially encouraging the mass bullying of another person. 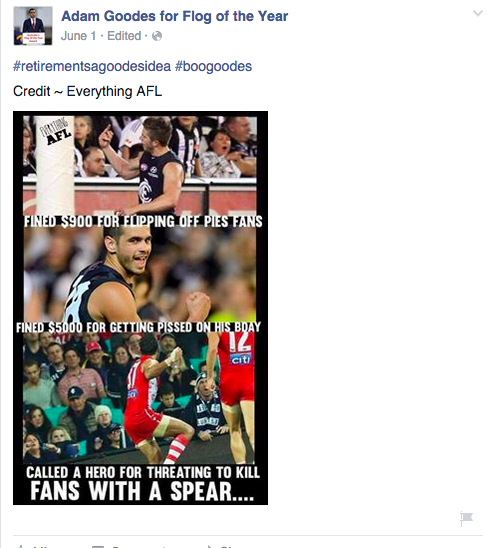 Here are some Facebook pages supporting the mass ritualised booing of Adam Goodes. We also request you to report the racist content that we have published above. You can also comment on this briefing here.